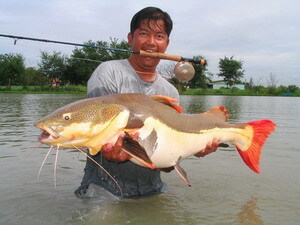 Our bespoke Fly fishing holidays in Thailand offer visiting fly fishermen the chance to fish for a variety of exciting predatory species ranging from Giant Snakehead , Chaophraya Catfish and Barramundi to more exotic Amazon fish such as Arapaima and Sorubim. Whether choosing a daily fishing trip or weekly holiday Fishsiam can provide guided fishing at a range of different venues in Thailand. For more details about this fast growing and exciting branch of sport contact us using the button below.